Hill’s Ideal Balance Mature No Grain Dog Food is a complete diet developed to improve your dog’s health in his late years. This grain free balanced diet contains natural ingredients to meet the needs of mature dogs over 7 years. Made with a high content of fresh chicken, this food provides optimum protein levels. When dogs are getting older, they run around less, which can lead to weight issues. 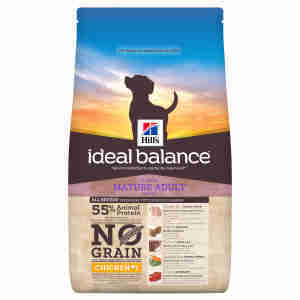 Hill’s Ideal Balance Mature No Grain helps improve your mature dog’s wellbeing, reducing their risk of becoming overweight. Omega 3 and 6 fatty acids, vitamins and minerals help to strengthen the immune system. Cranberries provide antioxidants to protect the cells from free radicals. Chicken meal (14%), dried potato (14%), potato starch, yellow peas (14%), dried peas (14%), digest, animal fat, dried beet pulp, flaxseed (2%), vegetable oil, minerals, dried carrots (0.9%), dried tomato pomace (0.8%), dried citrus pulp, dried grape pomace, spinach powder. Protein 20.5%, Fat content 12.9%, Crude fibre 4.1%, Omega-3 fatty acids 0.93%, Omega-6 fatty acids 2.76%, Crude ash 5.4%, Calcium 0.87%, Phosphorus 0.60%, Sodium 0.23%, Potassium 0.74%, Magnesium 0.09%; per kg: Vitamin E 730mg, Vitamin C 115mg, Beta-carotene 1.5mg. Vitamin A 37,629IU, Vitamin D3 1,580IU, E1 (Iron) 230mg, 3b202 (Iodine) 2.3mg, E4 (Copper) 29.2mg, E5 (Manganese) 10.1mg, 3b603 (Zinc) 196mg, E8 (Selenium) 0.5mg; with natural antioxidant.